Paranormal Shark Activity is another fun platforming game about a shark trying to eat a dude and so the dude keeps on jumping from platform to platform sometimes hitting bouncy objects and obtaining a bomb randomly hanging in the air which the dude uses to throw at the giant killer shark. Thus making the ferocious beast change position and giving whoever is playing a heart attack. Or is it about surviving for as long as you can while trying to earn all of the medals and one secret achievement in the game. Anyways, the game is very entertaining and is really good to kill some time with. Achieving higher medals are difficult (we could use some cheats on this =)). 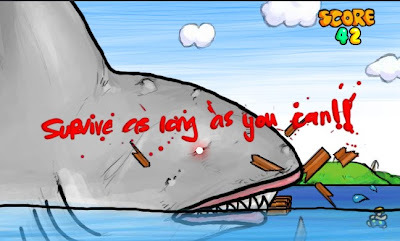 Meanwhile, here is a PSA Paranormal Shark Activity walkthrough video showing the gameplay.